The artists are coming, the artists are coming. 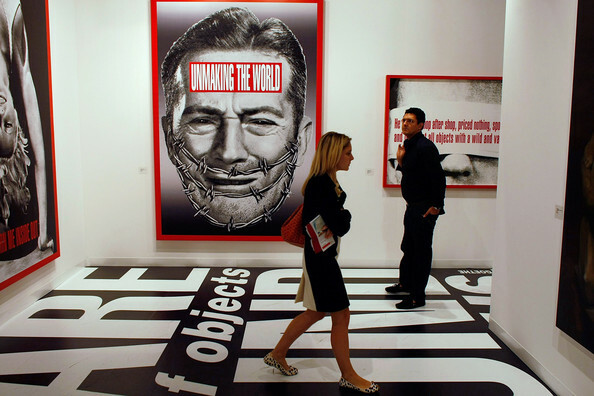 And so are the art dealers, the collectors, the critics, the celebrities, the wannabes, and the whole wondrous, over-the-top, aesthetic throwdown that is Art Basel Miami Beach, the biggest fair of modern and contemporary art in the country. Not only is the fair itself spectacular—40,000 people are expected, more than 250 galleries from every corner of the world and more than 2,000 artists are represented—but Greater Miami is transformed into an art medium, with satellite events all over town, and that for which our town is famed: partying. Sometimes it can be hard to tell entertaining and entertainment from art. A woman with her head in a case full of crude oil is art. A man jumping out of an airplane and slowly parachuting to the beach is art. Chinese folk who barely speak English selling virtual real estate for real money, that’s art too. Weird art, but art nonetheless. Come hang with Art Basel. You may be amazed, delighted or befuddled. But you won’t be bored. That’s for sure. As with most Miami and Miami Beach events, there is public and private. If you’re on the list—meaning you write for an important art journal or, most importantly, are a high roller collector—you’ll be invited to private homes for soirees. But do not fret. Our collectors take this opportunity to show their stuff, and there will be plenty of places to visit outside the main hall. More and more, Miami is home to galleries and private spaces the size of small museums. Some are not to be missed. The site is the Miami Beach Convention Center, where at other times one can see exotic cars or assault weapons. An exclusive VIP reception launches the fair, which runs December 2-5. The Convention Center is turned over to exhibitors, the core of whom will be at the Art Galleries sector, with representation from Coral Gables to Zurich. The Gables gallery, by the way, is Luis Cernuda, new to Art Basel this year, and whose specialty is modernist Cuban art. Other sectors include: Art Kabinett, with 20 separate thematically curated exhibitions; Art Nova, where 50 emerging artists will be shown; and Art Positions for 14 young galleries from around the world that show cutting-edge projects. But the economic times have spurred a move toward security. “We could see a trend favoring more developed artists,” Speigler says. “Collectors are looking more for sustained careers than for rapidly-rising prices. There’s less speculation, and more collection-building.” The Convention Center is huge. The size of the fair is daunting. Wear comfortable shoes and clothes, even as you strive for hipness. You’re in this for the long haul and you have not even gotten started. Some would say that life in Miami Beach is already performance art, a happening. That a random stroll down Lincoln Road will bring you face to face with the unexpected. True. But Art Public wants to up the ante. On the public spaces of Miami Beach curator Patrick Charpenel of Guadalajara, Mexico, will set up projects to engage you, the passerby, in something you should walk away calling an art experience. And right on the beach, a city block will be devoted to The Oceanfront, spaces built for Art Basel Miami Beach 2010, where contemporary art, performance, video and music will be happening. A nightly program from December 1-4 will feature one of four cities—Berlin, Detroit, Glasgow, and Mexico City—in experimental multimedia shows. In an area of the Convention Center, Art Salon is a series of informal discussions by figures in the art world who will talk about currents in contemporary art. There will be book launches at Art Salon, as well as panels and lectures. Waste Land, an award-winning film by Zurich’s This Brunner, journeys from Brooklyn to the world’s biggest garbage dump outside Rio de Janeiro, where Brunner photographed pickers of recyclable materials. The work is the feature of the fair’s Art Film. For some, this is the heart of Art Basel, when Miami’s museums, art institutions and private collectors open their doors to the public, usually with special exhibitions meant to coincide with Art Basel. Before Art Basel kicks off, the New Art Dealers Association has its own art fair on December 2-5. Trends young. The Rubells like to exhibit works for the first time. And this year, the unseen new acquisitions happen to be mostly by women, a coincidence that has given the show an unintended theme. Among them are Cecily Brown, Rosemarie Trockel, Elizabeth Payton and Kaari Upson. The term “Warehouse” well represents this museum-sized collection, which is showcasing this year’s shows, including Africa: Photography and Video, Michelangelo Pistoletto Broken Mirror Painting, Brian Alfred Digital Animation, and two massive carvings by American sculptor Jene Highstein. Another important private collection, that of Ella Fontanals-Cisneros, this year’s CIFO highlight will be a special screening of William Kentridge: Anything is Possible, a film on the creative process of the South African artist.December 4 at 8 p.m. Admission is free but one must RSVP at the above number. By Enrique Fernández for Poder360.